At its March monetary policy meeting, the Federal Reserve (Fed) raised its benchmark interest rate, the fed funds rate, by 25 basis points to a range of 1.50% to 1.75%. This was the result the markets were anticipating. It was Jerome Powell’s first meeting as Fed chair, so many observers were anxious to see if his approach or communication style might differ. While his comments were a bit more succinct than that of his predecessor Janet Yellen, we did not see any radical departure from prior Fed communications or approach. I think the takeaway from the meeting was one of continuity, and the markets seemed to take comfort in that. Market observers will dissect the nuances of Powell’s comments and the Fed’s economic forecasts to determine what may come next, but the Fed appears to be continuing its gradual, data-driven approach to policy decisions. The Fed’s official statement seldom changes much at each meeting, but it did note the economic outlook has strengthened in recent months, which I think is noteworthy. The Fed updates its economic projections each quarter, and we did see a reflection of improving US economic fundamentals. The Fed raised its 2018 US growth forecast to 2.7% from its prior forecast of 2.5%. The Fed’s inflation projection (based on Personal Consumption Expenditures) remained the same at 1.9% for 2018, but is expected to slowly move up to 2.0% in 2019. The Fed’s projection for 2018’s unemployment rate edged down to 3.8%, from 3.9% prior. The Fed stood with its projection of three interest-rate hikes in 2018, putting the federal funds rate at 2.1%, but the Fed projects it will rise to 2.9% by the end of 2019, higher than its previous projection of 2.7%. There has been recent speculation about whether the Fed will raise interest rates three times this year or will actually raise them four times. The Fed’s newly updated “dot plot” for the course of monetary policy still reflects a total of three rate hikes this year, which includes the latest move. 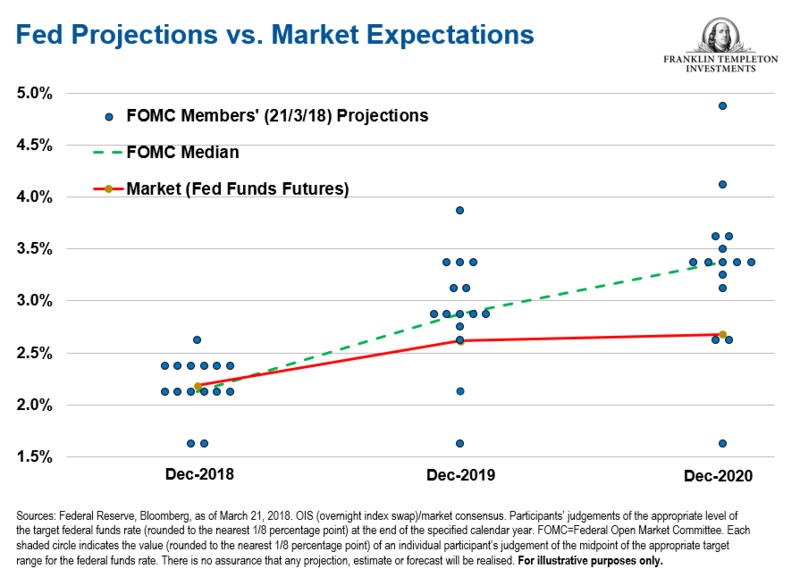 Although projections for 2019 and 2020 show a slightly more aggressive pace of tightening than the projections communicated in December, the pace still remains modest. Whether it’s three or four rate hikes this year probably doesn’t matter all that much, in our view. Fed policymakers have repeatedly stated their actions are based on the latest data, so these projections are just guidelines. What matters more is the fundamentals of the economy—and to us, the US economy looks pretty solid. Economic growth continues to look very favourable in 2018 and into 2019, with tailwinds from tax reform as well as some near-term fiscal stimulus. The labour market remains strong—as the Fed chair noted, 240,000 jobs were added on average per month over the past three months. Consumer sentiment is also very solid. The corporate environment should likely benefit from tax reform. And, the global growth environment looks supportive. Given this healthy economic backdrop, the risk is whether inflation starts to heats up faster than the Fed projects. Earlier this year, the equity market experienced heightened volatility amid fear that inflation—and interest rates—would rise too far, too fast. While we anticipate interest rates and inflation are likely to continue moving up, we believe potential increases in both should be gradual, and that type of gradual movement shouldn’t derail the markets. The Fed doesn’t see any signs of inflation accelerating, which would be good news for investors given the projections for a strong economic backdrop. There has been some debate surrounding the Fed’s “longer-run” rate of 2.9% (which was increased from 2.8% prior). That’s still a low rate historically and probably not something investors should worry too much about. Get more perspectives from Franklin Templeton Investments delivered to your inbox. Subscribe to the Beyond Bulls amp; Bears blog.